(CNS): A 51-year-old man sustained multiple fractures on Boxing Day after he fell 60 feet while climbing on the Bluff, Cayman Brac. Police said the climber, who was visiting from the US, was taken by the emergency services to Faith Hospital, where he was stabilized but found to be in need of emergency care and surgery due to the extent of his injuries. As a result, the RCIPS Air Operations Unit were contacted to medevac the casualty as a matter of urgency. The police chopper was reconfigured into its air ambulance role and the duty crew, along with a critical care nurse, flew to the Brac to collect the injured man. The helicopter took him to Grand Cayman but he has since been transferred to a US hospital, where he is said to be in stable condition following his treatment at the George Town hospital. 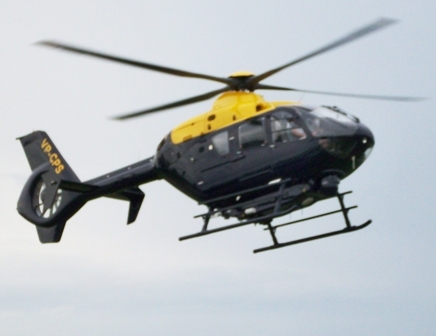 "The police helicopter is always available for the benefit of the security and safety of the residents and visitors in the Cayman Islands," a spokesperson stated. “The Air Ambulance in critical care cases is one of the roles the crew prepare and are in readiness for, and we are pleased to be of assistance." Sorry, but as someone from the aviation industry localy has stated before, the use of the helicopter in this manner is a complete waste of money due to the wear and tear it puts on the helicopter. This was also highlighted before by professional agencies from overseas. Conduct an FOI if you don't believe me. It was pointed out that with the fact that the helo has to land at both airports and can not land at the hospitals, like in other developed countries, it was a waste to use it for this purpose when there are aircraft capable and less expensive to use. Conduct an FOI if you doubt me. While it was a good job, I believe as do many other professionals, that this is just another PR campaign to justify the use of this helo. Maybe if an FOI was done the numbers will tell the truth. Great job by all involved in the rescue and transport of this injured person. There seems to be a large climbing community that visits the Brac to climb the various routes as described on a web page that I found, putting this incident aside as it may not be related, what is in place to assist or rescue climbers that are not easily accessible? Are our first responders trained and have the necessary equipment? Who monitors the destruction of rock formations that have been posted on the website showing a broken 50 lb stalactite and a male who had to receive stitches after it fell on him? Who monitors how close the climbers come to the nesting birds? What are the liabilities on the Govt or private landowners for injuries or death of any climber? Who has a business license to offer climbing vacations to the Brac? Just some relevant questions here that I believe need to be answered. Respect the Bluff, Respect the Sea and critical care would not be necessary. Nice response from the emergency services in helping to save a life. It's also comforting to know that we have an emergency services helicopter able to provide round the clock support in the police, medical, coastguard and search and rescue roles when called upon to do so.